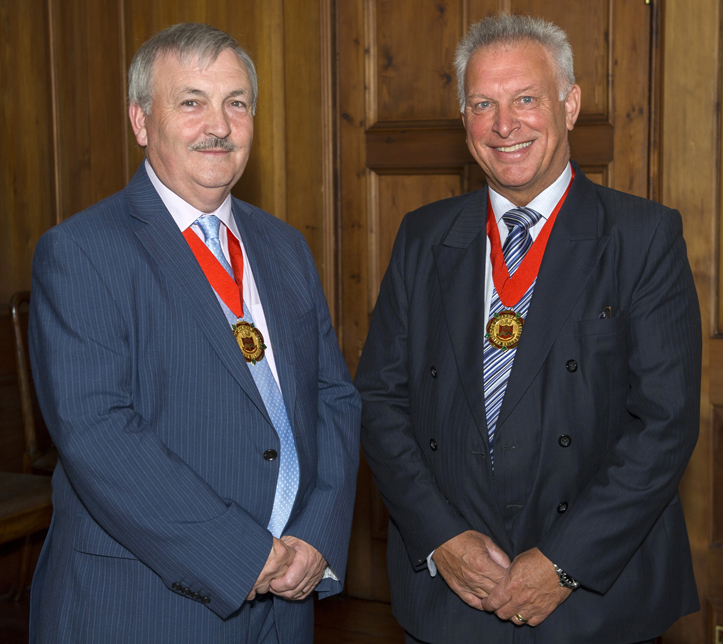 New Wardens of Rochester Bridge were elected at a Special Meeting of the Wardens and Assistants held at the Bridge Chamber on 1 June 2015. Alan Jarrett stepped up from Junior Warden to Senior Warden, and Russell Cooper was chosen as the new Junior Warden, both having been elected for two-year terms ending in May 2017. Deputy Leader of Medway Council, Alan Jarrett was first nominated by Medway Council to the Rochester Bridge Trust in 2005, and he has served as Junior Warden since May 2013. Russell Cooper, a Fellow of the Royal Institution of Chartered Surveyors and an Associate of the Chartered Institute of Arbitrators, was appointed by the Trust as a community trustee in 2007. Standing down after serving as Junior Warden from 2009 to 2011 and as Senior Warden from 2011 to 2015, Russell Race, D.L. was thanked for his leadership during his term. Two new Assistants were also nominated by local authorities to the Rochester Bridge Trust to fill vacancies. Derek Butler was nominated by Maidstone Borough Council following the retirement of Paul Oldham, who had served twenty years on the Court, including terms as Junior Warden from 1997 to 1999 and Senior Warden from 1999 to 2001. Sarah Hohler was nominated by Kent County Council to fill the vacancy created by the resignation of Bryan Sweetland earlier in the year. The Court of Wardens and Assistants is composed of six nominated members, three by Medway Council, two by Kent County Council, and one by Maidstone Council, each serving a term of four years. The Court then appoints six additional members from the community, chosen for their expertise in finance, engineering, estate management, or other areas useful for the business of the Trust, each serving a five-year term. When vacancies arise for appointed members from the community, advertisements are placed in the press to seek the widest range of candidates. Each year the twelve members of the Court elect two of their number to serve as Junior Warden and Senior Warden for the following year.